Republican presidential candidate Marco Rubio speaking at a news conference at Temple Beth El in West Palm Beach, Fla., March 11, 2016. WASHINGTON (JTA) – Israel has prominently emerged as a presidential campaign issue ahead of critical primary contests in five states on Tuesday, three of which – Ohio, Illinois and Florida – have substantial Jewish communities. Israel was the subject of a heated exchange in the Republican debate last week in Miami, with front-runner Donald Trump hammered by his opponents for saying he would be a neutral broker of Israeli-Palestinian peace. Trump has defended his position as essential to achieving a peace deal between Israel and the Palestinians, but his three remaining rivals for the Republican nomination said they would stand with Israel and that no peace agreement is possible. The real-estate magnate parried the criticism by noting his love for Israel and his daughter Ivanka Trump, who converted to Judaism when she married Jared Kushner, the scion of another real-estate family. Trump said there was no one “on this stage that’s more pro-Israel than I am,” citing his role as grand marshal of the 2004 Salute to Israel Parade in New York, which prompted some laughter in the audience. And he defended his promise of neutrality, saying it was essential to achieving a peace deal. The Israel discussion was the most expansive one on the subject in any Republican debate this season, and it continued even after the debate concluded. 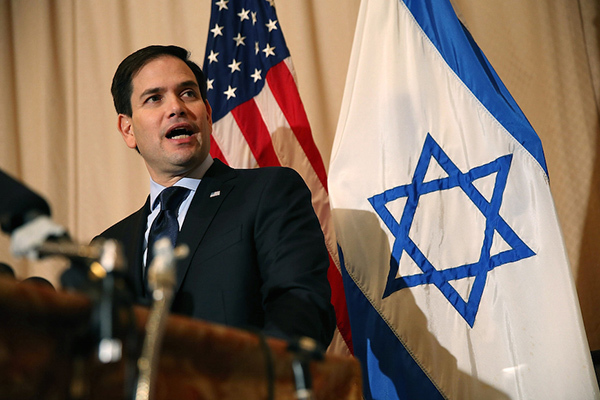 Rubio’s campaign sent an email blast immediately after with the subject line “Trump Is No Ally to Israel.” The next day, surrounded by prominent Jewish backers — including Adam Hasner, a close colleague of Rubio when they were both in the Florida Legislature, and Dan Senor, a veteran of the George W. Bush administration — Rubio took aim at Trump in an appearance at a West Palm Beach synagogue. “We are electing the next commander-in-chief, and when the one leading in the polls will not take sides, imagine if he were president?” Rubio said Friday at Temple Beth El. “For people in the Orthodox community, and more broadly in the pro-Israel community, who have a view they are unhappy with the Obama administration because Obama’s approach has been more neutral, Trump talking in those terms is not reassuring,” said Nathan Diament, the Washington director for the Orthodox Union. On Sunday, Ohio Gov. John Kasich, also needing a win in his home state on Tuesday, notably pivoted on a key Israel-related issue, saying on the Fox News Network that he now favors suspending the Iran nuclear deal. Until now Kasich, like Trump, has said the deal is a bad one, but that he would first consult with experts before suspending it. Kasich said his mind was changed by Iran’s recent ballistic missile tests. Ted Cruz, the last of the four remaining contenders for the Republican nod, took his pro-Israel message to voters through social media, a campaign official told JTA, reminding them of his pro-Israel activism in the Senate. Cruz’s Jewish surrogates have appealed to Jewish voters whose names they compiled from synagogue membership lists and made appearances at Jewish voter events in South Florida. Hillary Clinton, the front-runner in the Democratic race, has also been reaching out to Jewish voters ahead of the Florida primary. But her message has emphasized not so much her differences with Bernie Sanders, the Independent Jewish senator from Vermont who has mounted an unexpectedly tough challenge for the nomination, but to the threat Trump poses to Israel. Sarah Bard, Clinton’s national Jewish outreach director, said Trump’s incendiary rhetoric had helped their efforts to mobilize campaign volunteers. “Where we had a hard time pushing volunteers out the door, he does make our job easier,” Bard said. Clinton has been leading in Florida polls, but after last week’s upset in Michigan, she is leaving nothing to chance. Rep. Ted Deutch, D-Fla., a Clinton supporter and the top Democrat on the U.S. House of Representatives Foreign Affairs Committee, held a conference call Monday with hundreds of rabbis across the country. Rep. Steve Israel, D-N.Y., is speaking Monday with Jewish students at Florida Atlantic University on Clinton’s behalf. And Sen. Barbara Boxer, D-Calif., held a call Sunday with Jewish leaders organized by the Clinton campaign. Another Clinton surrogate, Robert Wexler, a former congressman from Florida, in a weekend Op-Ed in the state’s Sun-Sentinel newspaper, warned that neither Sanders nor Trump has the understanding necessary to handle the Middle East, though he didn’t name either candidate. Sanders has called for the normalization of ties with Iran in the wake of the Iran nuclear deal reached last year. Deutch said in his pitches to Jewish voters, he contrasts Trump’s “neutrality” with Clinton’s record. “After hearing the comments that Donald Trump has made, I have found that, with Secretary Clinton’s strong support for Israel, her very clear position that the United States, both during speeches and in debates, that the United States will stand with Israel, they found these very reassuring,” he said.